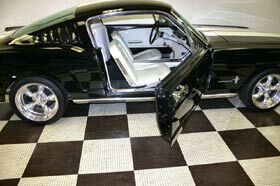 1965 FORD MUSTANG, NEW LISTING!!!!! BLACK AND WHITE 2+2 WITH A 4-SPEED. It just doesnt get any better. This car looks amazing!!!!! 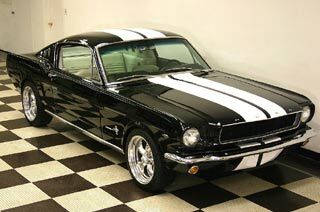 This is a recently restored 1965 Mustang Fastback 2+2. Its a rare fastback because of the color combination and being a factory correct car with 289 V8 engine, Toploader 4-speed transmission and 8 inch rear end. It has the factory correct colors both exterior and interior. Exterior is Raven Black while the interior is White with a full console and a fold down back seat. No rust whatsoever. his car is so clean underneath you could eat off it. 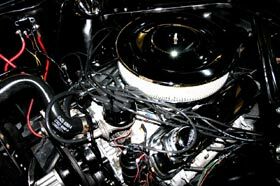 Every square inch of this car was disassembled and media blasted to bare metal inside, outside, underneath and engine bay. Not a single speck of paint was left on this car. Exterior was just painted Raven Black base coat/clear coat. Interior is new with the following replaced; BRAND NEW windshield (all other glass is original), BRAND NEW headliner, BRAND NEW seat upholstery, BRAND NEW carpet for floor and BRAND NEW fold down rear seat carpet, BRAND NEW dash pad, BRAND NEW steering wheel, BRAND NEW door sill plates, BRAND NEW kick panels, BRAND NEW rear view mirror, BRAND NEW instrument bezel, BRAND NEW door panels, BRAND NEW floor mats, all BRAND NEW weatherstripping, etc.The exterior has BRAND NEW window molding, BRAND NEW re-chromed Ford bumpers, BRAND NEW front grille, BRAND NEW door handles and locks, trunk lock, BRAND NEW gas tank and sending unit with original 65 Ford gas cap in excellent condition.